In this fine and very elegant image, the Buddha is dressed not in monastic robes, but in Burmese royal costume with winged elements on his knees, and on his shoulders and upper arms. He has copious jewellery including winged bracelets, chest ornaments, a bodhi leaf necklace,and prominent earrings. He wears a tiered crown decorated with rows of lotus petals. 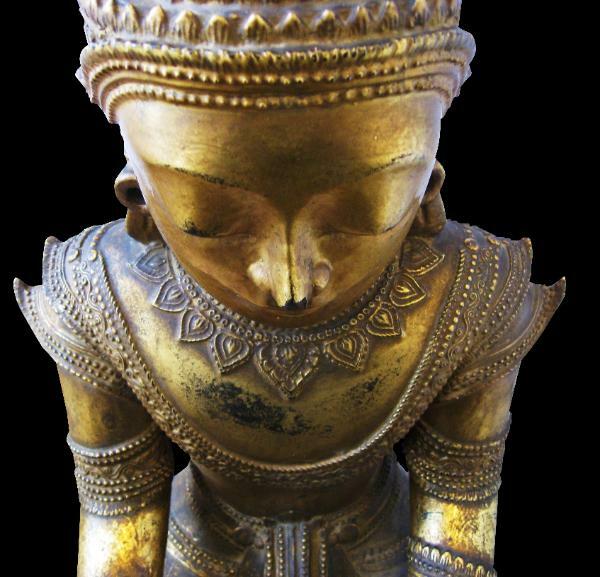 In essence, the Buddha is shown not as a monk, but as a king. 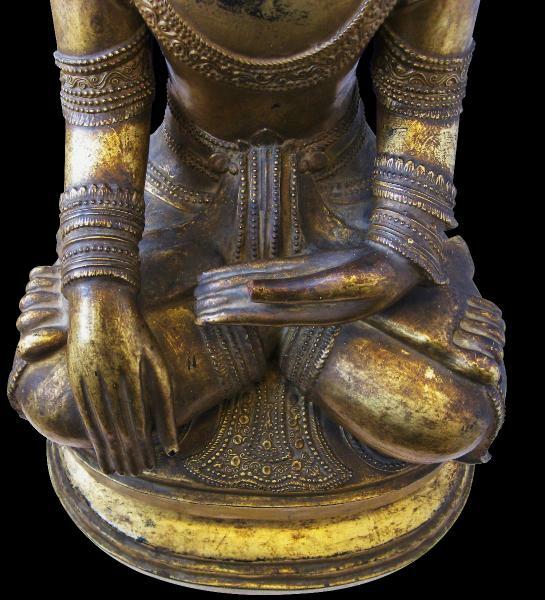 The Buddha is shown seated on a tiered, waisted platform, in bhumisparshamudra; his left hand rests, palm upward, on his lap and the right hand rests on his right knee, calling the earth to witness. The image is composed of hollow dry lacquer on a wooden base and is decorated in gold leaf. According to Isaacs & Blurton (2000), the dry lacquer technique of sculpture production appears to have originated in China. It is not clear when the technique first started to be used in Burma, but by the eighteenth century the technique was well established. It had largely been lost by the mid-twentieth century. The method involves a core image being modelled in clay. This is then covered by a wash of fine ash and water on top of which is applied a putty of lacquer sap and teak sawdust. This is further moulded and shaped, thus providing what will become the completed image. Once the outer mould is dry, the inner clay core is removed and the outer image can be sealed, coated with a refined lacquer mixture, polished and gilded. The end result is a fine but very light sculpture. 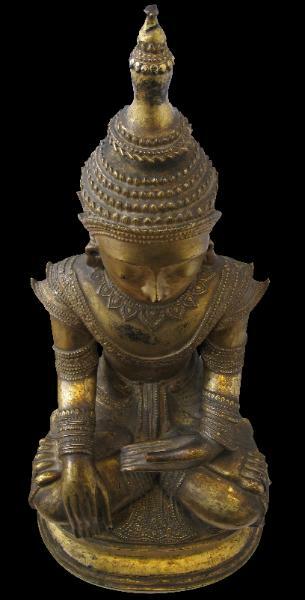 The British Museum has a Buddha also of gilded dry lacquer which it ascribes to the eighteenth or nineteenth century and which entered the museum’s collection in 1919. 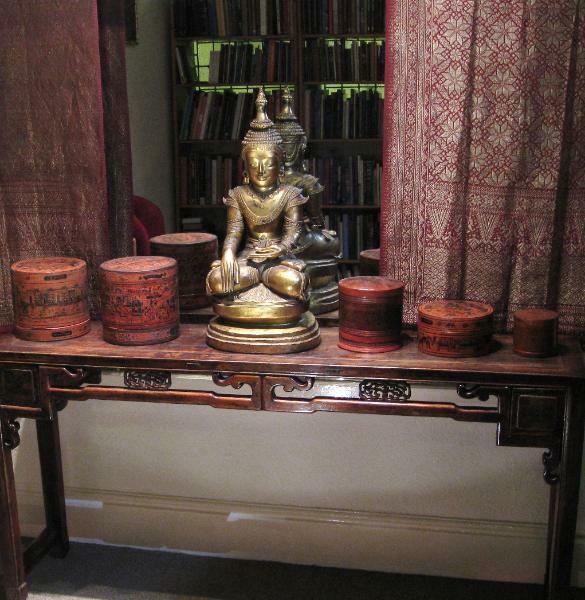 The Museum’s example also shows the image dressed in the garments of a Burmese king. It is of similar height. (See Isaacs & Blurton, 2000, p. 75). from a UK private collection. 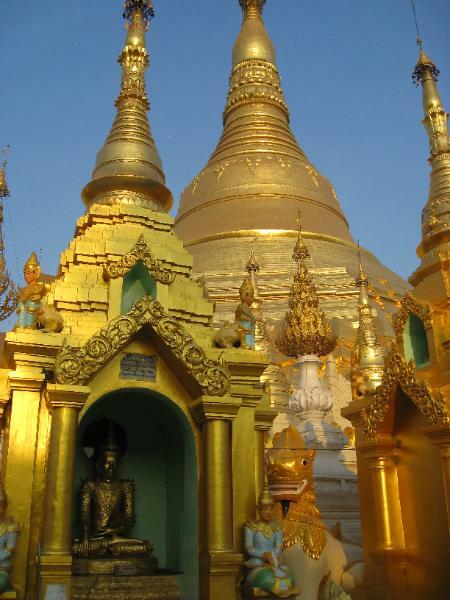 An image of the Shwedagon Pagoda, Rangoon, Burma. A Buddha image in courtly robes can be seen in the niche in the lower left of the picture.